A strategy cooperative multiplayer game. 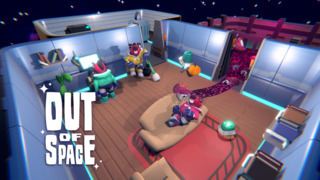 Out of Space is a strategy couch-fun cooperative game in which the players must successfully move to a new space-house and make living there possible. Cleaning, gardening, decorating, getting rid of aliens and not dying by their toxic dirt are some of the tasks that need to be done by the players to try to make the house cozy enough to win.